I am a huge Justine fan, which may explain why I’ve been selling their products since 2007. I was first introduced to their Tissue Oil 30 years ago after fainting in the City and getting a funny scar under my eye where I had slammed my cheek into the concrete pavement. The product that is head and shoulders above all the competitors is their Tissue Oil. You just don’t get better and with winter nipping at our heels and the dry dull skin that comes along with it, its time to get your kit together to help you fight off the dull skin drudgery of the coming months. Nothing says healthy as dewy skin does. Justine has products to keep you and your skin in tip top shape the entire winter long. No excuses for looking drab and dull gals – from Head to Toe. If your skin gets extra dry over the winter months, there are some easy solutions. 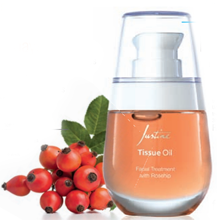 Justine has a special Tissue Oil face product. Facial Treatment with Rosehip, which you apply at night for extra nourishment and moisturising. So many women forget all about their feet during the winter months as they’re closed up in thick socks, pantyhose and boots. However, taking care of them is really possible and quite divine. They have an amazing range named PediPerfect which includes a Parrafin Foot Mast, Micro Smooth Foot Dermabrasion which you can follow with Luxury Foot Butter, which is so decadently divine or Heel balm to help keep your foot moisturised and show perfect. Visible Monday … David Tlale or Zara? Love Justine products … Put my order in yesterday!! !